That were our group—Tim Bromilow, Peter Chappell, Rachel Darling, David Jamieson, Esperanza Martin Gil, Aaron Lawton, Jason Williamson in Libby Urquhart. All were participants in European program Leonardo da Vinci (short LdV), which base on exchange a good practice of non formal education. The leader of hosting organisation (VITRA Cerknica) was Bojan Žnidaršič with assistant of son Tine. 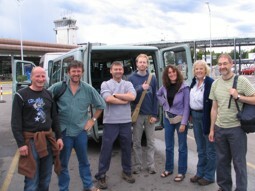 The participants arrived in airport Ljubljana in the early hours of afternoon. With minibus they arrived in our location the apartment Dialog in Hruškarje village. After early dinner we check the whole plan of exchange activities. We started our new day with visit the Cerknica Lake model with multivision. 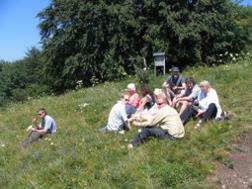 After that we arrived around Cerknica Lake and stopped for lunch time in the tourist farm Kontrabantar. In the afternoon we found the nice shadow in natural park in Rakov Škocjan where we visited the small natural bridge. The day we finished in the final presentation of youth research camp in Natural park which was organised by Public institute Notranjski regijski park. Via Bloke plateau we arrived to Kocevska Reka. 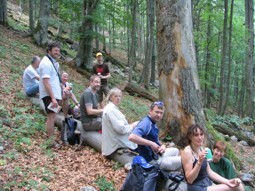 We had a nice walk across the virgin forest Krokar (crow) Kocevje with local leader forester Mirjam Mikulic. Our day finished in tourist farm Marolt, where we could saw how people really live in countryside. In dinner time joined to us the last member of group—Libby. After the breakfast we went to Menisija. We met with the Judita and Alojz Unetic, members of Tourist association Menesija. They were the leader for walk by Bears footprints path. We visited also the sheep farm and taste home brandy. 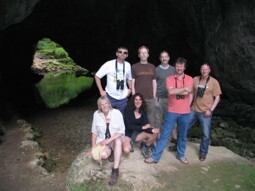 After typical countryside lunch (potato “zganci”) we visited the Krizna cave with guide Alojz. To our apartment we took the way via beautiful Bloke plateau. After dinner we went to the village fireman event, which is typical for countryside. Our first destination was Planina field. After that we came to Pliskovica where we met Igor Maher. 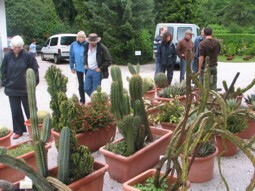 First, we visited The village development centre (Youth hostel) and renovate spring (typical for Karst). After lunch in tourist farm we went to Education path. Our day finished with tasting karst wines and smoked ham in karst cellar. We walked to the natural waterfall Pekel (Hell). 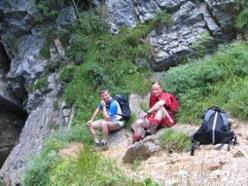 The walk was very steep and follows the course of the waterfall using ladders and handrails fixed in to the rock. Swimming was just for braves. After the lunch our adventure took us to the Bistra Technical museum of Slovenia. That open air museum was built around an old monastery. It houses exhibitions about forestry, fishing and hunting as well as housing reconstructed watermills and machinery. The day finished in our “old” location—Hruškarje where we had the final evaluation of the exchange. 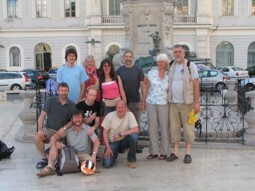 After full days of trips we were very pleased that we had also one relax day. 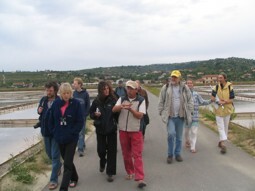 In the morning we took a walk to the Zala river valley (wild and rudimental area). After that we had very tasted and reach lunch in tourist farm in Osredek. Afternoon was reserve for individual relaxation. 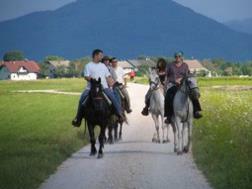 Some members of the group decided for horse riding. 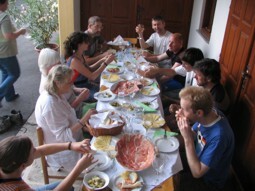 The last hours the participants used for walk in the Slivnica hill (nearest hill of Cerknica) and prepare as typical English people—English lunch—sandwiches. After that we drove to the airport and friendly greeting.